More freedom for broadcasters on impartiality? A fascinating decision today by Ofcom (8 October 2018) suggests the regulator might be adopting a slightly softer line on due impartiality. All broadcasters involved in this area should study it very closely. It is quite exceptional for Ofcom to issue an 18 page not in breach (yes, NOT in breach) decision on impartiality. So there must be a reason. The case revolved around a special edition of LBC’s James O”Brien Show broadcast on 27 October 2017. 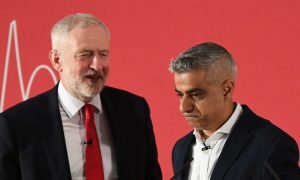 It was presented by the Labour mayor of London, Sadiq Khan, and the headline grabbing part of the show was an interview he conducted with the Labour leader, Jeremy Corbyn (pictured together). Khan’s interview with Corbyn was very sympathetic in tone with no really challenging questions. So – not surprisingly – three listeners complained that the the phone-in was effectively “a party political broadcast”. Ofcom investigated under Rule 5.5 (due impartiality must be preserved either within the programme itself or in a “series of programmes taken as a whole”) and 5.9 (alternative views must be adequately represented in “personal view” programmes). Global Radio (LBC’s owner) put up a doughty and well-argued defence, which clearly caused Ofcom to take its time (almost a year) before publishing its not in breach decision. Ofcom (questionably perhaps?) decided that due impartiality was maintained within the programme itself. There were a handful of comments by Khan, which suggested a potential rather than any real challenge to the Labour leader, and there were some mildly critical questions by callers who phoned in but Jeremy Corbyn got a very soft ride. Ofcom noted this and suggested that LBC could, and should, have done more. However Ofcom went on to examine the argument that impartiality was maintained by a “series of programmes as a whole”. LBC argued that some comments in other news programmes later the same day helped preserve impartiality. They also pointed to the fact that Sadiq Khan was just one of five stand in presenters for James O’Brien that October week. The other four were: Jacob Rees-Mogg MP (Conservative); Chuka Umunna MP (Labour) ; journalist Kevin Maguire; and journalist Robert Peston. Ofcom has historically interpreted the meaning of this term narrowly – the other programmes must be editorially linked, dealing with the same or related issues within an appropriate period and be aimed at a like audience. The regulator rejected Global’s argument that the programmes broadcast on the same day were editorially linked; but agreed that the other four stand-in programmes were. Some of the other four presenters did use some words suggesting an editorial link but the wording was not used consistently. Nonetheless Ofcom concluded that these extra programmes were an additional means by which impartiality was maintained. Ofcom ended by taking account of the importance of political speech in the context of freedom of expression and concluded that neither rule was broken.